T.B. 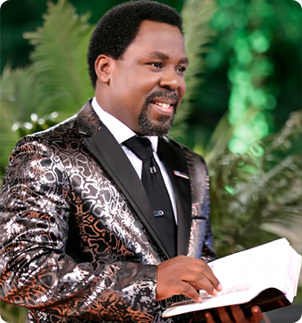 Joshua is the General Overseer of The Synagogue, Church Of All Nations (SCOAN). The Founder is Jesus Christ! He is just one of those who has humbly submitted to the will of God (Isaiah 6:8). Born on June 12th 1963 in Ondo State, Nigeria, T.B. Joshua’s journey is a humbling story of how God raised a young man from a poverty-stricken home to lead an international ministry that would attract thousands worldwide to witness the reality of God’s power today. From dropping out of secondary school in his first year to working in a poultry farm; from teaching little children while attending evening classes to washing people’s legs on the muddy streets of Lagos; from a forty day fast to receiving a divine call and starting a ministry with a mere eight members – the life of T.B. Joshua is a story of amazing grace and unwavering focus. Today, he is a mentor to presidents yet a friend to the widows and less privileged, a role model to his generation yet a humble and hardworking man, toiling tirelessly for the advancement of God’s kingdom. His story is an encouragement that there is hope for the weak.